Two events last week prove the theory of coincidence. Catherine came round with a packet of liquorice seeds, and a magazine asked me to go to Portsmouth for a story they were planning. Catherine grows all sorts of vegetables and fruit in her garden just off the South Circular. She gives the larger vegetables names; Boris and Bertie were two pumpkins treasured for months and spoken of as if they were cranky relatives till one day she rang with the news: “I ate Boris last night. It was his time.” Bertie found his way to us, but he didn’t last long. Last year she gave us a huge marrow she’d grown on the stable’s muck heap. Clarissa carved a face onto it and sat it on a chair in the kitchen. She called it ‘Madonna of the Marrows’. We had another marrow from Catherine named Rodney. He’s been eaten too, lightly steamed with some lamb chops, Rodney didn’t last long. I know a bit about liquorish, it’s one of those peculiarly English slightly bonkers things where an entire town seems to revolve around one industry, and the good-times look as if they’ll never end, but they do. Pontefract in South Yorkshire is steeped in liquorish lore, fact and fiction. The legend is that Cluniac monks from Spain brought liquorice plants to the Pontefract area around 1090, this is perhaps why even today you’ll hear liquorice called ‘Spanish’ in Yorkshire. Pontefract Cakes, the small round black sweets stamped with an image of Pontefract castle, date from 1614 and were sold as a cure for stomach problems. Famously liquorice is a laxative, but it also contains a range of B vitamins and zinc and manganese. It is a natural antibiotic, good for sore throats, coughs, arthritis, excema and shingles. If you suffer from high blood pressure then avoid liquorice, it might be the death of you! Pontefract was the centre of the world’s liquorice trade, a town built on liquorice you might say. 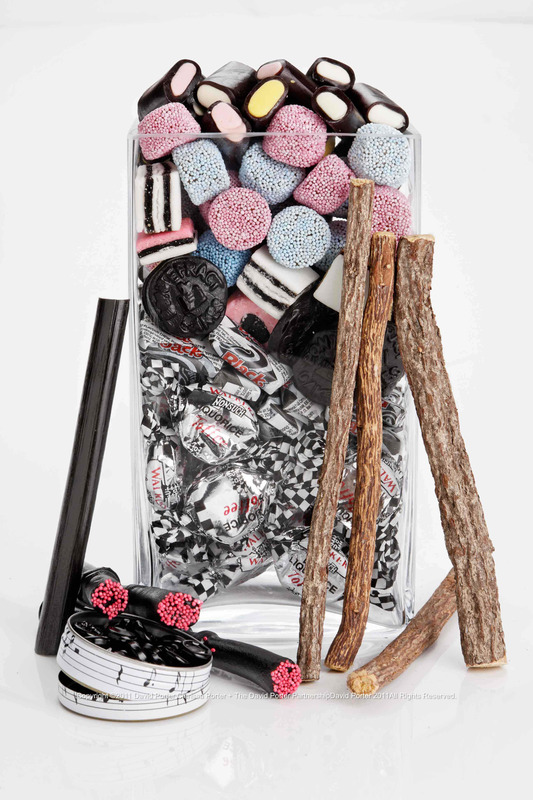 In 1760 one local grower began adding sugar to his liquorice and manufacturing sweets. Liquorice is harvested by cutting the roots, which are processed into the liquorice we know and love. 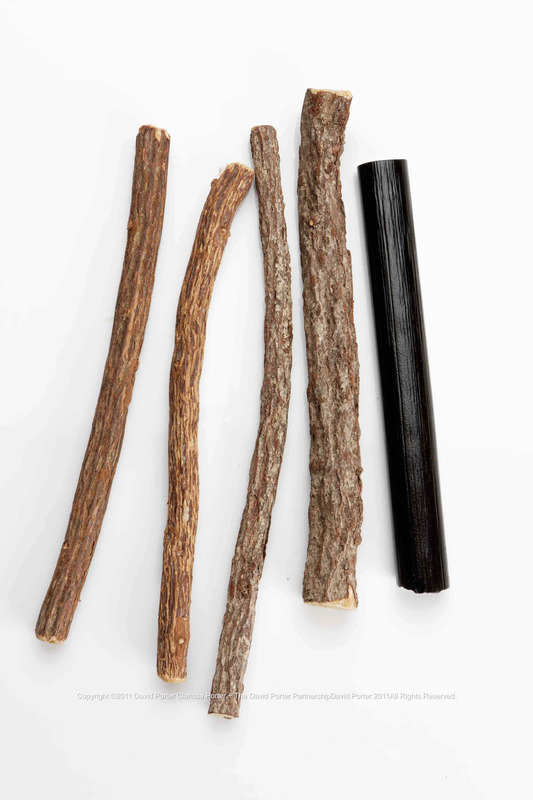 You can buy unprocessed sticks of liquorice wood in some chemists, it looks exactly like a piece of wood or a twig. Nigel Slater remembers it was the really cool kids that chewed liquorice wood, the rest of us sucked on sherbert fountains. 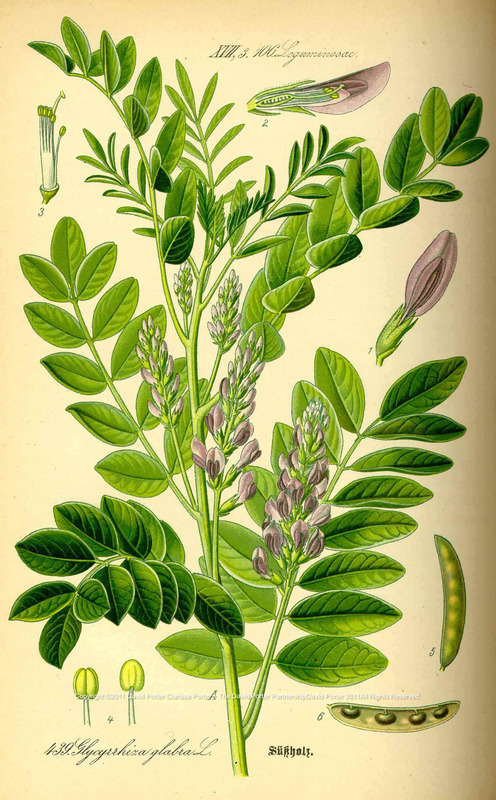 Today 90% of the world crop is used by the American tobacco industry, but liquorice is found in beer, food products, and some womens’ cosmetics. You might eat or drink some liquorice every day without realising it. At first liquorice was a real cottage industry. People grew liquorice in their gardens or smallholdings, they took in the harvested roots and soaked them before winding them through a mangle to extract the juice. Liquorice water, made with nearly pure black liquorice from the chemist’s was thought to be a cure-all, Napoleon was dosed with liquorice water as he lay dying. With the arrival of the Industrial Revolution, the liquorice industry of Pontefract became concentrated in factories. Seventeen factories mostly employing women were producing Pontefract cakes, in 1900 . At the start of World War II Pontrefract was producing 400 tons of liquorice a week. The War was the beginning of the end for Pontefract liquorice as workers were moved to producing armaments, and the only liquorice produced was for medicinal purposes. 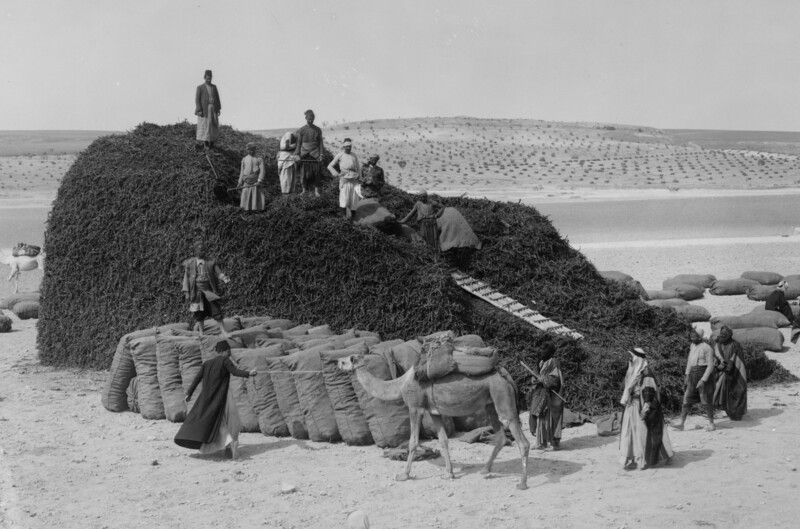 After the war cheap imports forced the decline of the home-grown product. 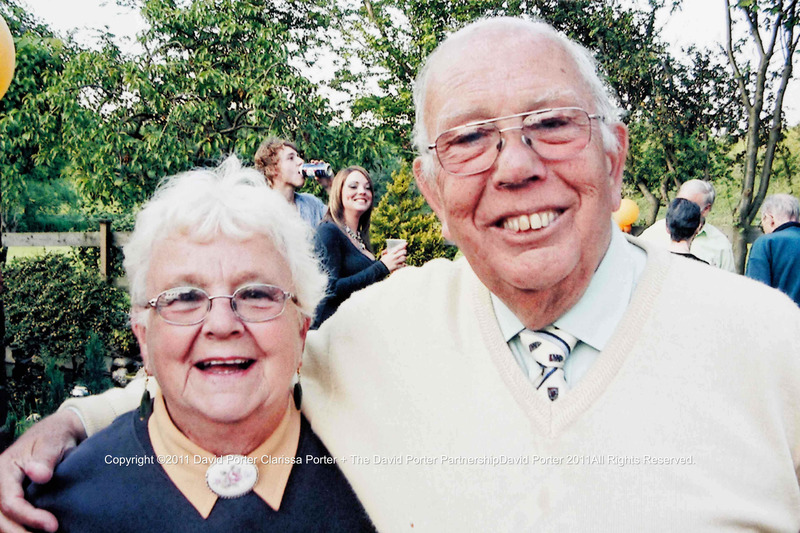 I spoke to Tom Dixon, nearly 80 now who worked for Wilkinson’s, one of the biggest factories. Tom’s family were one of the big five liquorice-growing families, so Tom is a living link to the past. He lives in a house built by his great-grandfather overlooking some of the disused liquorice fields. Liquorice roots were stored in the big cellars till the market price was right for selling. Tom still grows a few liquorice plants in his garden, and three years ago chef Glynn Purnell visited with a film crew to record an episode of the “Great British Menu“. Tom gives talks about Pontefract’s past at the annual Liquorice Festival and is a fund of interesting facts. He told me about the liquorice found in the pyramids, how the Chinese have used it for 3,000 years, and that archaeologists found Roman liquorice along Hadrians Wall. Hannibal gave his elephants liquorice to chew as they crossed the Alps, says Tom, and Bedouin give their camels liquorice to quench their thirst. Tom met his future wife at Wilkinson’s. One day Molly accidentally packed her engagement ring into a box of Liquorice Allsorts, so someone had a nice surprise! 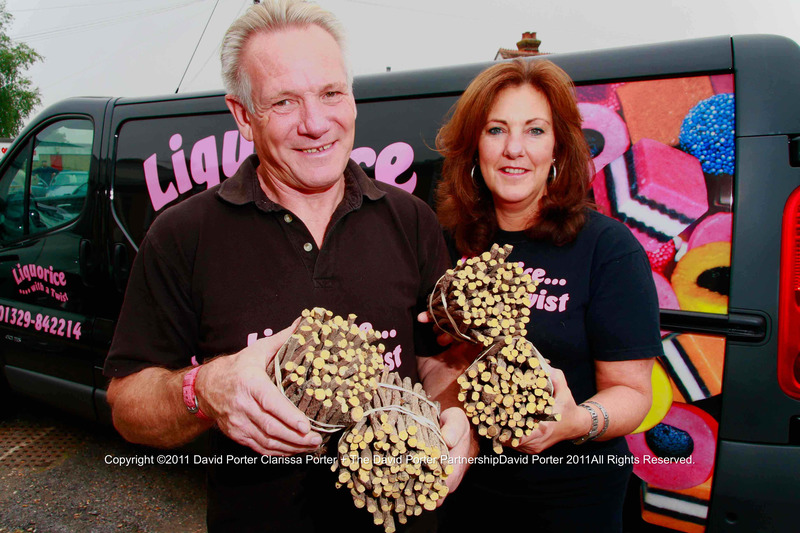 If you’d like to know more about Pontefract liquorice I’d recommend ‘Liquorice‘ by Briony Hudson and Richard Van Riel published by the City of Wakefield. As I said, two things happened last week. Catherine and her liquorice seeds reminded me I had some sticks of culinary liquorice. We’d tried cooking with liquorice after reading about Heston’s salmon poached with liquorice gel. But you can’t cook with Liquorice Allsorts, you need pure culinary liquorice and luckily on a previous visit to Portsmouth I’d come across ‘Liquorice With A Twist‘. There was a romance about the Pontefract liquorice fields, it is magical isn’t it just imagining fields of liquorice. John Betjeman thought so and wrote a poem celebrating love, lust, liquorice, and longing. He knew that ‘lickerish’ means both liquorice and lecherous. There is an old saying “a sheep’s eye and a liquorice tooth,” which means a shy loving glance hiding the fire of lust. Here’s a recipe for liquorice ice cream we’ve served with roast peaches, you could serve it before it sets as a sweet custard. Pour the milk into a large pan and stir in 1 tablespoon of the sugar, add the liquorice and the coffee beans, then bring to the boil. The liquorice will melt, simmer for 5 minutes, then allow to cool for 20 minutes to half an hour. This will let the flavours mingle. While it is cooling, beat the yolks till they are creamy and thick. This might take 10 minutes! Add the vanilla seeds, the powdered milk, and the remaining sugar to the beaten yolks and give it a good stir. When the milk and liquorice mixture has stood for about 20 minutes, and is cool, add the egg mixture to the milk, and stir them together. Return the saucepan to the stove and gently heat, stirring till the mixture thickens. Now prepare a bowl of ice or iced water, large enough for you to fit the saucepan into, have it next to the hob ready. When the milk mixture has thickened, you’ll know when that is don’t rush, take the saucepan from the heat and still stirring plunge it into the bowl of ice. Continue stirring for a few minutes then strain the mixture through a sieve and pour into a dampened plastic container. An old ice cream tub would be fine, but it should have a lid. Put the container into your freezer. From time to time remove from the freezer and give it a good stir to prevent crystals forming. If you’ve an ice cream maker then use that. After a few periodic stirrings leave to freeze completely. I left mine overnight. When you’re ready to serve halve the peaches and remove the stones, dust them with a little sugar and dot with butter and tuck in a few fresh bay leaves. Roast them on a baking sheet in your oven heated to 200C (400F) for about 25 minutes. 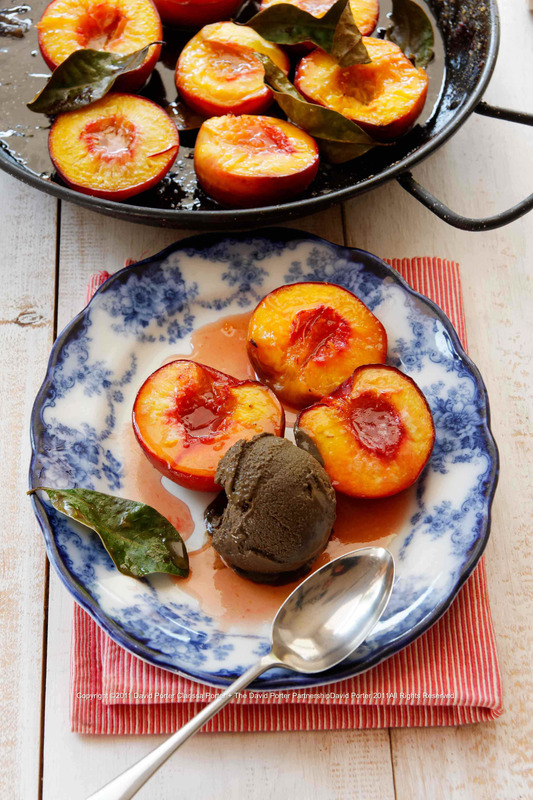 Serve the peaches drizzled with the juices, and warm, along with a scoop of the ice cream and decorate with a bay leaf.